Rabid NeverTrump Russell Moore and his ERLC employees have bashed fellow Southern Baptist and Senate candidate Roy Moore. Moore stands as the GOP candidate in the election for the open U.S. Senate seat from Alabama. The lack of support for Moore is shocking, given the threat to life and religious liberty posed by his Democratic challenger–a challenger who supports unrestricted abortion and a secularist view of government. Of course, the failure to stand up for Republicans is nothing new for lifelong Democrat Russell Moore, but the leftist infestation of the ERLC would no doubt shock most Alabama Southern Baptists. You can view screenshots of Carter’s tweets. 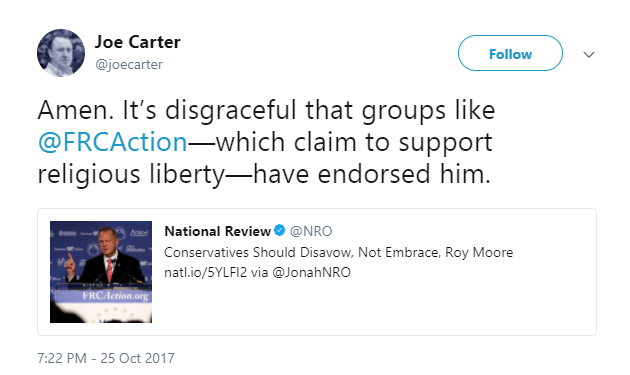 Carter claimed it was “disgraceful” that groups like FRCAction endorsed Moore. Then on Facebook, Carter double down on his attacks. He called Judge Moore a “nut job.” Then asserted Judge Moore believed something that to my knowledge, Judge Moore has never advocated. Folks, this is who draws a big, fat paycheck from your tithes and offerings. Southern Baptists should wake up. Of course this isn’t the first time the ERLC has abandoned any semblance of support for Alabama’s Roy Moore. There you have it. Russell Moore believes that a Christian cannot hold public office and have any disagreement with the secular philosophy or secular commands of the state. In other words, public service must be a safe space from consistent Christians. ERLC president Russell Moore sits on a George Soros-funded Pro Open Immigration group, Russell Moore has lied about the Gospel narrative and called Jesus an “illegal alien,” and now his ERLC group sits silently by while its employees savage fellow Southern Baptists on Twitter. Again, your tithes and offerings at your local Southern Baptist church support these men in their attacks on a fellow Southern Baptist—the only man running in the special election who is pro-life and pro-religious liberty. Russ Moore should resign immediately!! Now I️ see why he was asked the question at the 2017 SBC, “Are you saved?!! I wonder, given the events of the past several days, whether your full-throated support of Roy Moore still hiolds. What full-throated support? I think it is disgusting that people paid by Southern Baptists don’t reflect the values and priorities of the people who pay their salaries. Those are vastly different issues than Roy Moore and his qualification for office. This is about Russell Moore and his attack dogs in the evangelical establishment. Attack dogs paid to attack Southern Baptists. Let me phrase the question another way: do the allegations of sexual misconduct against Roy Moore make him any less qualified, in your opinion, to represent the state of Alabama in the United States Senate? Additionally, does Russell Moore’s belief that the allegations do just that, and his willingness to say so publicly, in your mind, constitute an attack? Thank you for posting this article. There are many fatal inconsistencies in the allegations made by the attackers. russell moore and his fellow leftists ignore these inconsistencies, while at the same time they also ignore the more serious allegations of pedophilia against their favored establishment politicians. russell moore is definitely a wolf in sheep’s clothing. I cannot see how such a far left radical who supports the pedophilic establishment can possibly be a Christian. Who are these established leaders that you claim are favored by Russell Moore, what allegations have been lodged against them, and what statements have been made by Russell Moore in support of them? Do you not pay attention? Are you not aware of pedogate? Pedogate involves both the bushes and clintons. Do you not know about this? russell moore favored homosexual marco rubio during the Republican primary. russell moore, democrat, was a de facto clinton supporter during the campaign. Pay attention. You have made a whole host of accusations. Where is your evidence? Many fine independent journalists have investigated pedogate. I would suggest Jake Morphonios for one. If all you do is listen to CNN and other deep state news sources, you are going to be ill informed. That is why you know nothing about this subject. Pedophilia and child murder are rampant among the elite. Swamp rat russell moore has nothing to say about this issue. But swamp rat russell moore is quick to condemn Roy Moore, against whom there is no credible evidence. The swamp rats don’t want a true Christian like Roy Moore in the senate. russell moore is just another swamp rat. If you are getting your “news” from people like Dave Hodges, Jake Morphonios, and The End Times News Report, there is truly no rational way to have a conversation with you. So, I’ll continue attending — and tithing to — my Russell Moore defending church and go on about the business of THE CHURCH: preaching Christ cruficied and arose to a world desperate to hear it. If you and your brethren here on this website aren’t interested in doing that, may I respectfully ask that you stay out of the way of those of us who are? OK. I’ll continue to get news from serious independent journalists, while you get your “news” from the deep state. When events in Korea and Arabia turn to WWIII, and the Great Tribulation begins, you will obey your leader, false Christian and swamp rat russell moore, to take the mark of the beast. You put forward big talk about how great a Christian you are. But you hate a real Christian such as Roy Moore and participate in the slander against him. If you hate real Christians, your “Christianity” is a charade. Your so-called “Christianity” consists of nothing more than political correctness and following the fads of this fallen world. Such is the same with false “Christian” russell moore. As soon as you face the coming adversity, you will fold. Your “Christianity” will be a forgotten memory. Yeah, I’m not even going to attempt to address that first paragraph; my tinfoil hat is off being polished and I have no desire to wade into a discussion about the deep state without one. But I would like to correct you on this point: I don’t hate Roy Moore. I didn’t think he was qualified to be a U.S. Senator before the allegations emerged and I still don’t, even as I freely acknowledge that the allegations are just that and he may well be completely innocent. I don’t know him well enough, or his accusers well enough to make a judgement either way. I really hope you did some stretching before you posted that, because those leaps in logic you were taking could tear a hamstring in half. You equate my criticism of Roy Moore with hate and my defense of Russell Moore as idol worship and then add both to conclude that my trust in the Lord Jesus Christ as my personal Savior is false. Which you have an absolute right to do, by the way. If attacking my faith, and trying to end the career of Russell Moore helps you sleep at night, feel free. As stated previously, I will be about my Father’s business, bringing the word of the Lord to those who need it most. If that’s something you are interested in, we welcome you. If not, well, the sheep will be seperated from the goats one day. You choose to be willingly ignorant. You cannot get a full picture of the world from CNN. I also knew that you would claim that you don’t hate Roy Moore. Liberals drip with hate as they claim that they are full of love. You also began the questioning of the faith of others because they choose not to restrict their worldview to the politically correct binders of CNN and russell moore. Swamp rat russell moore doesn’t care about truth.